After a wait of four years anime 'Attack on Titan' finally returns with a bang! Season 1 of "Attack On Titan" graced our screens in 2013. "Attack on Titan" originated as a comic and was adapted as an anime by Wit Studio and Production I.G. The series centers on a desolate future in which huge man-eating "Titans" have destroyed most of humanity. The second season of the anime returned after a long four year wait on April 1, 2017. Since then episodes have been airing steadily week by week developing the story line of protagonist Eren Yeagar (voiced by Haruma Miura). The story picks up where season 1 ended with the capture of inside traitor Annie Leonhart. From there the series picks of speed with some confusing twists and turns. The second season does not disappoint as each episode is filled with moments of terror and death as the remainder of humanity continue to fight for their lives. 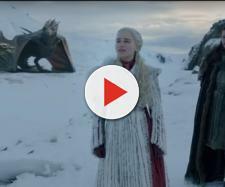 Characters are not spared from their untimely deaths and in a "Game of Thrones" fashion, the audience is aware that their favourite might not survive another week. The quick pace of the plot and the dismissal of life is what makes this season of "#AttackonTitan" both gut wrenching and enrapturing. Season 1 of "Attack on Titan" consisted of 25 episodes. Each episode lasted a maximum of 25 minutes and because of this, the audience barely had time to get adjusted to the anime before the first season was over. This meant that the mystery surrounding the "Titans", the huge man-eating beasts, was left largely untouched as the show creators instead focused on the shocking transformative abilities of Eren Yeager. The protagonist discovers that he can transform into a "titan" which begs a whole range of questions about the unknown beasts. Thankfully, as the second season unfolds the mystery of the "Titans" is beginning to unravel. The introduction of more human/titan characters leads the audience down a path of discovery as Eren and his friends find out who the real enemy of humanity is. The abilities of the various types of "Titans" are explored further as well as the limitations of Eren and people like him. This unraveling mystery creates a nightmarish quality to the anime keeping the audience hooked. The next episode in the second season of "Attack on Titan" is due to air on June 3 and will be the 10th episode of the season. The popularity of the anime has dropped because of the 4 year gap between the first and second season, however there's no doubt that it will draw its audience back in as Season 2 continues.